Harrow Weald Lawn Tennis Club (HWLTC) acknowledges the duty of care to safeguard and promote the welfare of children and adults at risk. The Club is committed to ensuring safeguarding practice reflects statutory responsibilities, government guidance and complies with best practice and LTA requirements. have a positive and enjoyable experience of tennis at Harrow Weald Lawn Tennis Club in a safe and inclusive environment. are protected from abuse whilst participating in tennis. We encourage all our members to read our safeguarding statement and policy, which can be found via the links below. Download and read our full safeguarding statement. Download and read our full safeguarding policy. If you've a concern, report it by submitting this form. Our safeguarding policy addresses the Concern Reporting Procedure. 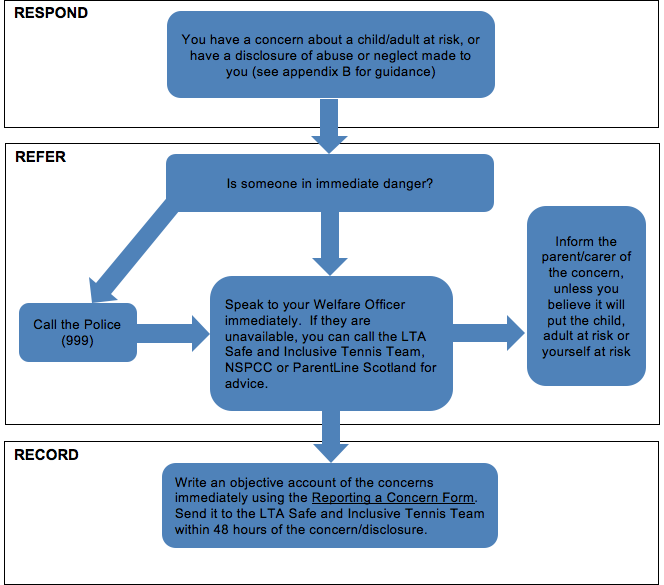 Anyone who is concerned about the wellbeing of a child or adult at risk at the Club, or has a disclosure of abuse or neglect made to them, should report it to the Club's Welfare Officer. GET FIT, HAVE FUN and make friends AT HWLTC!